The river cruise industry continues to expand at a furious pace, with a new player in Europe and a new product in the Pacific Northwest. Plus, another operator is offering luxury train transportation to its riverboats in the Heartland. Here are the latest developments. Niche operator Cruise & Maritime Voyages is introducing cruises on the Rhine and Danube rivers starting in May, John Dennis, vice president of CMV North America announced. The company will operate the Vienna I river ship, which he described as a “premium-plus vessel” that has French balconies on most staterooms. “Over 80 percent of our guests have indicated they would consider taking a river cruise, and the general feedback from our trade partners re-enforced that this would be an excellent complement to our current ocean cruise program,” Dennis said. The first cruise, the seven-night “Magical Rhine” itinerary from Nuremberg to Amsterdam, will depart May 19. Then it will operate two 14-night cruises between Amsterdam and Budapest departing May 26 and June 9. Seven-night segments are available. Fares for a seven-night cruise start at $1,799 per person, including selected drinks with lunch and dinner and a range of half-day excursions. For 14 nights, rates start at $3,299. In the U.S., the American Queen Steamboat Company will launch its newly refurbished American Empress on April 5 in Portland, Ore., to operate cruises on the Columbia and Snake rivers. The itinerary features calls at Astoria and The Dalles, Ore., and Stevenson, Sacajawea State Park and Clarkston, Wash. The nine-day trips are priced from $3,795 per person, based on double occupancy, and include a one-night pre-voyage hotel stay, shore tours in all ports and complimentary wine and beer with dinner. 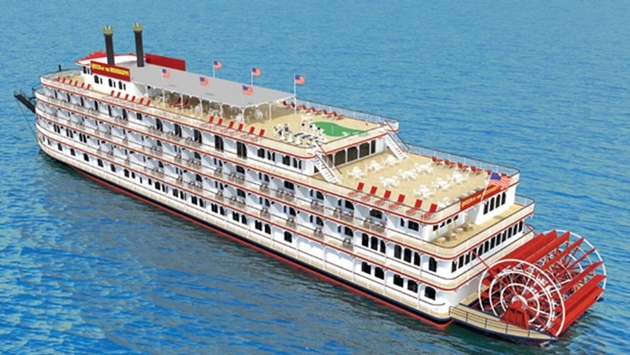 Also in the U.S., American Cruise Lines has partnered with Uncommon Journeys to offer train transportation to its paddlewheeler Queen of the Mississippi (pictured). Three “rail and sail” packages are offered in 2014. For example, the “American Legends” package July 2-12 includes complimentary or $99 train travel to Chicago, two nights at the Palmer House Hilton and travel aboard a 1940s Streamliner train to St. Louis with complimentary meals and drinks. After a hotel overnight and sightseeing in St. Louis, guests depart on a seven-night steamboat cruise to St. Paul aboard the Queen of the Mississippi to visit Hannibal, Mo. ; Burlington, Davenport and Dubuque, Iowa; La Crosse, Wis.; and Red Wing, Minn. All meals and entertainment while aboard are included.